Light Seeker: Someone who is curious about the mysteries of their inner world. They seek to bring light/consciousness into the dark/subconscious depths of their being. They seek a rich, wild, and revolutionary understanding of who they truly are. They are at home in the unseen realm of intuition, dreams, healing, and magic. They can see the golden thread of consciousness /light in all that is. Gifts for Light Seekers: I have carefully curated a selection of my favorite intuitive, visionary and healing creations from independent artists, mystics, and witches. These truly are gifts for Light Seekers made by Light Seekers. A perfect way to support indie creators. Who I am: Let me introduce myself if we haven't already met. I am Nicole Piar, an artist, illustrator, writer and intuitive channel. I created the Spirit Cats Oracle Deck which features my world of fluffy philosophers sharing their healing messages. There are also Spirit Cats Gift Sets available in my shop. Vibrant, lushly-painted DARI LUNA art prints uplift with a colorful dose of joy and hope. These prints are like pure SUNSHINE. Goddess Lunar Bath Soak, Money & Abundance Intention Oil, and assorted organic herbal, magical concoctions from the BehatiLife Apothecary. Pure lusciousness!!! Madeleine Joan is a highly-intuitive, accurate tarot reader whose style is honest, friendly, and fun. I have gifted her 30-minute Skype Readings to my mom and 2 of my closest friends. They loved them! Gift certificates available. Inner Star Oracle ~ Clairity Edition by Jo Klima: A perfect pairing of Sacred Symbols and concise wisdom that connects us powerfully to our heart and soul. I have this deck and love its deep simplicity. Zen Den Candles: hand-crafted in the shape of crystal clusters and made from high-quality materials. Amethyst, Citrine, Aura Quartz, and gold-dipped candles. So unique and enchanting! 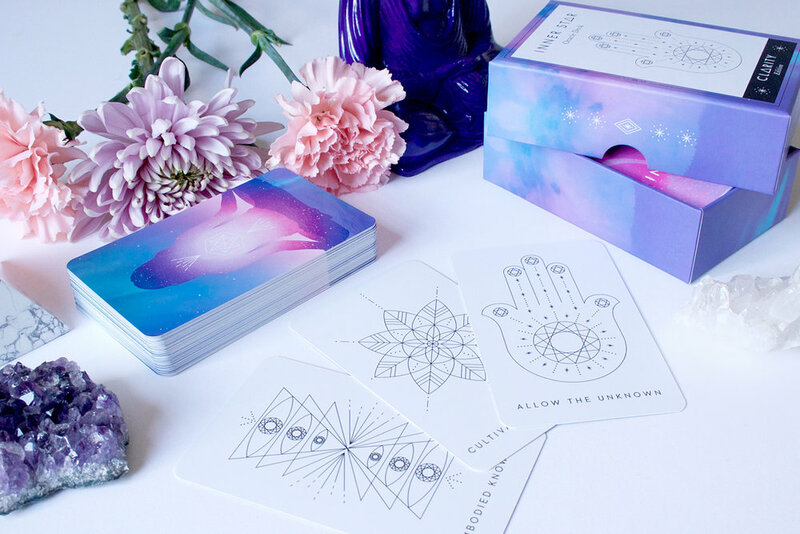 The Moon Sisterhood's UnHustle Bundle includes the 2018 Holistic Planner, Moon Cycle Workbook, Chakra Workbook, and Holistic Oracle Card Deck –everything a Light Seeker needs to find her flow and grow towards her dreams. Astrology Reading from the talented Aeolian Heart. Deeply healing and revelatory. Gave a Natal Chart Reading to my best friend for her birthday and she was blown away by how it made her feel deeply seen and inspired a loving embrace of her essential nature. She saw her unique beauty. Use Promo Code: HEARTCATS for 10% off. The crystal grids and crystals from Cave&Canyon will super-charge an altar space. Each grid has its own unique energy expressed through its sacred geometry. These are allies to our meditation, healing and magic practices. The Animal Allies Oracle Deck by Jessica Swift is bright, beautiful and brimming with wisdom. For the Light Seekers who are close to the earth and love to connect with animals, this deck calls to their wild heart. Resin Garden Crystals & Pendants and Smudge Sticks from Soul and Selene: Some flower magic to bedeck, cleanse, and raise the vibration of your body and home. What an unexpected and striking pairing of crystals and blooms. Celestial. Ethereal. Playful. I love these glittering, crystal Starchild Chokers from Aurora Shadow. This is jewelry from the heavens for sure. Two magical oracle decks from ETHONY, tarot reader and deck creator: Money Manifestation Cards ~ perfect for deep money healing and The Prince Lenormand Oracle ~ a divination tool. Crystals for healing and magic from THE OPAQUE. Love that purple Flourite Owl. So cute! Her jewelry is also amazing if you can catch her in a shop update. It sells out fast. Hope you enjoyed perusing the gift guide and found the perfect bit of magic to give your dearest Light Seekers. Thank you for supporting indie, mystical shops! P.S. For a quick dose of good karma, share this post with your friends.